For Overnight Use. Discreet incontinence pads suitable for sensitive skin. Comfortable and hypo-allergenic with 100% natural cotton coversheet. With absorbent particles locked into the core to minimise odours. 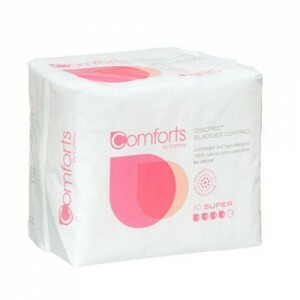 Comforts makes liners and pads specially designed for bladder weakness. 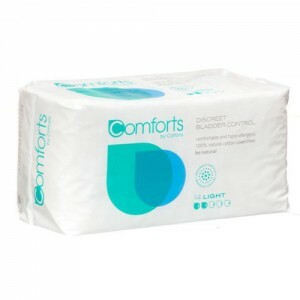 Comforts incontinence pads are made from natural materials with a pure cotton cover sheet which helps to minimise the discomfort and irritation of sensitive skin made worse by bladder weakness.